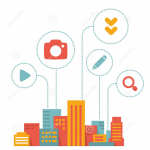 In the era of high competition between ecommerce merchants on the path to gain more profits and increase conversions, smart promotional campaigns have a crucial role. If you operate your store on the Magento 2 platform, the default functionality will be not enough to create effective promos. If you are looking for a way to amaze your customers with exclusive offers and deals, pay attention to Amasty Custom Promo Conditions for Magento 2. The Magento 2 custom conditions extension enables users to create custom promotions utilizing advanced conditions based on customers’ account info and orders history. Below, we describe how the Custom Promo Conditions module works in more detail. Advanced conditions combined with the default Magento rule conditions. By installing the Magento 2 advanced conditions module, you will be able to show your care and individual approach to your clients and gain their loyalty and trust to your brand. The highly targeted promotions you can create using Custom Promo Conditions will help you increase an average order value on your store and boost sales. The advanced conditions offered by the module allow creating personalized offers based on customers’ account details and previous purchases. Custom campaigns can be easily set by selecting one of the available advanced conditions or their combination. Thus, you can create targeted promo rules using customer attributes or purchase history as a basis for them. 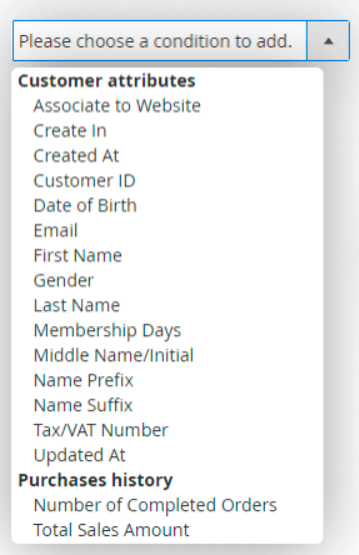 The Magento 2 custom conditions module offers 15 various options for customer attributes, like a birth date, gender, date of account creation, number of membership days, and more, from which you can choose a basis for your promo rules. This way, you could reward your customers with a personalized offer when their membership reaches the specified period. 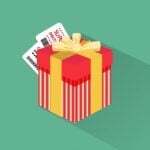 Also, you can create different rules for other occasions, for example, a discount for all men named Valentine on a St. Valentine’s Day, or special bonuses for customers registered on the first day your store started working, and many more. With the Magento 2 advanced conditions extensions, only your imagination is a limit. Another option provided by the promo conditions module is setting the rules based on the customers’ purchase history. You can leverage two types of conditions here: based on the number of orders or the total sum spent. 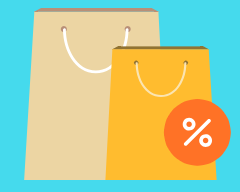 This way, you can grant special discounts to the shoppers who have completed 10 orders on your store or offer free items to the clients who have spent a defined amount of money on the purchases from your store. 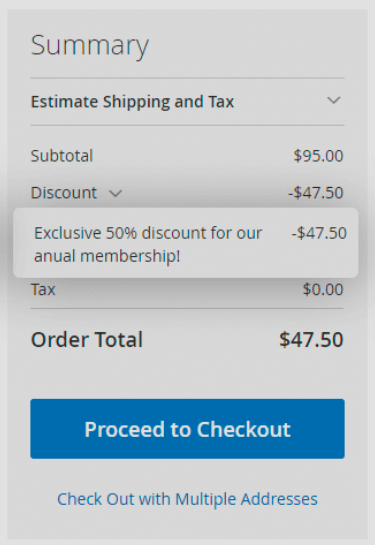 At the same time, you can use these conditions to incentivize your web store visitors to make more purchases after one completed order. 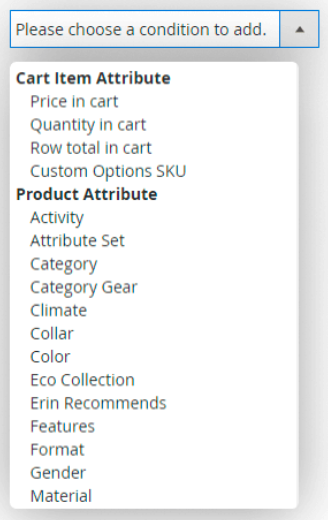 It is also possible to create combinations with multiple advanced conditions, as well as mix them with the cart item and product attributes available with the default Magento 2 functionality. Amasty Custom Promo Conditions is an easy-to-configure and at the same time beneficial solution for ecommerce stores for personalizing their promo campaigns. Utilizing advanced conditions offered by the Magento 2 module will let you achieve your conversion and sales goals in a shorter period. Besides, individual offers make customers feel like coming back to an online shop and boost their loyalty. 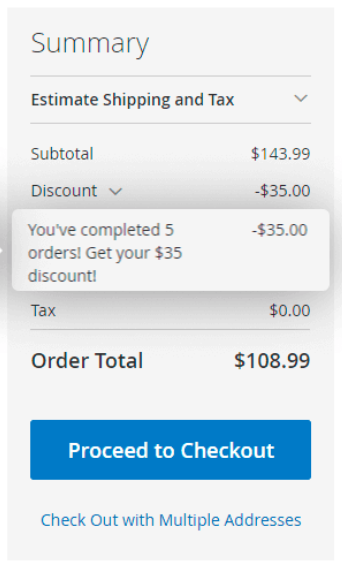 You can buy Custom Promo Conditions for Magento 2 for only $65, so don’t hesitate to click on the link below to get the tool.